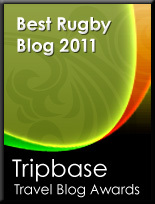 TOTAL FLANKER...a rugby blog: The future's brighter...? The long-running Welsh soap opera, otherwise known as the rugby career of Mr Gavin Church, looks like taking another twist after news emerged last week that the orange one is planning a return to rugby with the Ospreys in September. The perma-tanned Welsh centre last played 13 months ago and has played only 14 times for his country in the last 5 years, having endured a succession of injuries, the last of which put him out of contention for last summer's Lions Tour. At the time it was rumoured that he was seriously considering packing it all in, but it looks as if the pleadings of an increasingly desperate Warren Gatland may have persuaded him to return to the game in time to boost the Welsh World Cup efforts. It doesn't take Nostradamus, however, to predict that this will probably all end in tears.